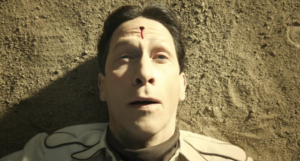 Filmmakers in the United States and Europe usually start their careers making short films, then “graduating” to features. More advanced in their careers, filmmakers should return to short-form narrative, if for no other reason than to help young filmmakers learn how to tell a story before becoming overwhelmed with the responsibilities of feature filmmaking. Film schools are part of the problem: students take classes taught by film scholars, who are almost exclusively interested in studying feature filmmaking. This merely serves to reinforce students’ interest in contemporary Hollywood long-format narrative; indeed, most students don’t know any other kind of film. Meanwhile, film production faculty are, for very good reasons, having students make short, 5-10 minute films. I cannot tell you how many times I’ve workshopped a student script that is ten pages long, but is trying to develop characters meant to be housed within a two-hour film. The situation is pedagogically untenable. With The Ballad of Buster Scruggs (2018), Joel and Ethan Coen have demonstrated that short-format filmmaking is not, nor should be, the exclusive domain of students and/or experimental filmmakers. 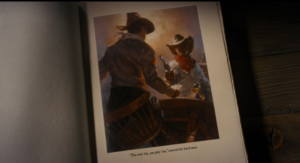 They have bundled six short Westerns into an anthology film named for the first story in the collection. The film causes us to meditate on how pulp literature created our mythology of the American West. 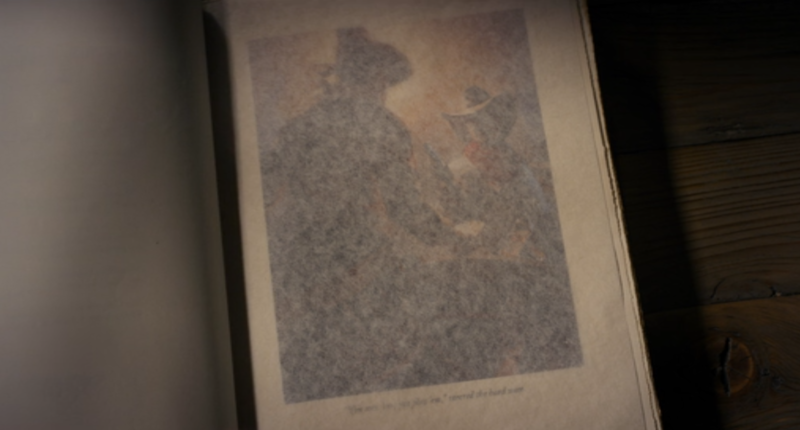 The first shot of the film is of a ragged hardcover book with a dark green cover. The simple illustration conveys the barren nature of the world depicted therein: a tree with no leaves, and a long since dead steer’s skull, picked clean. The closest thing in the literary canon to this cover is the set design of Samuel Beckett’s Waiting for Godot (1952), a rock and a tree alone on a barren stage. A color plate, at first occluded by a protective cover leaf, within the pages of the green book, introduces us to each of six short stories. At first, we can only ponder the image, as the caption below is indecipherable. 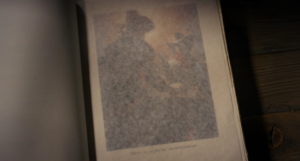 However, the camera pushes in such that we can begin to read the text below. The text sets up generic expectations that the subsequent film will transform radically. 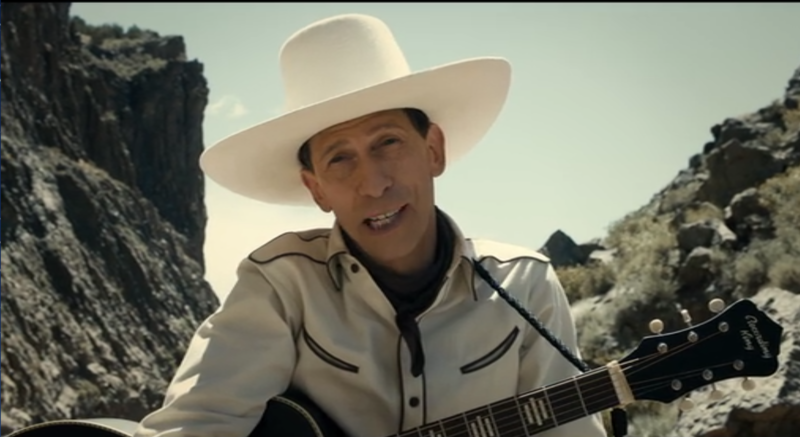 We get no sense that the film we are about to see is a comedy, directly referencing the singing cowboy films of Gene Autry. The text tells us that Buster is singing, but that in itself is not enough to capture the light-hearted nature of the musical comedy tradition in the American Western. The first shot of the short hammers home the importance of film in depicting the experience of the American West. 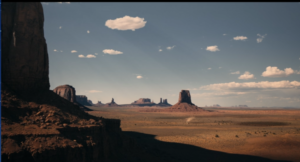 We see Monument Valley, the gravitational center of the American Western. The Searchers (1956), the most scrutinized American Western in academic film studies, features John Ford’s geographic expansion, whose opening superimposed text indicates the events take place in Texas, but whose film images were shot in Monument Valley, many hundreds of miles away. 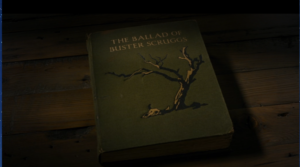 The opening of “The Ballad of Buster Scruggs” delivers the most aggressive aesthetic maneuver in any of the six short films. 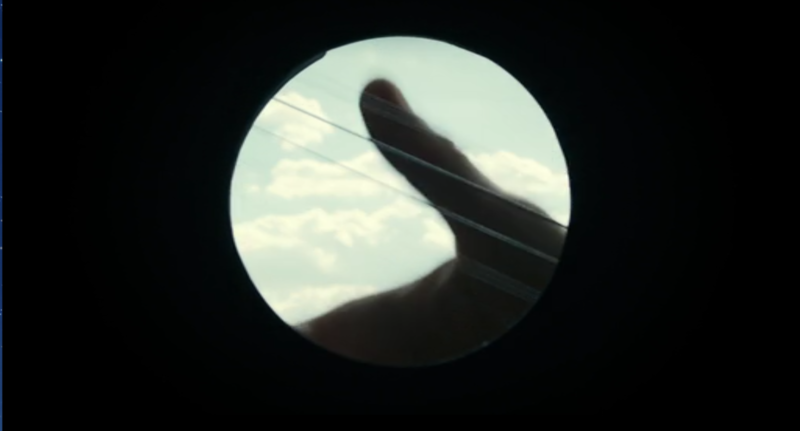 We cut to a camera position inside of Buster’s guitar, watching his hand pluck the strings. Like the appendage that flips the pages of the book, Buster’s hand reminds us that the generation of these sounds and images is directed by human beings engaged in various artistic practices to construct the experience of the American West. 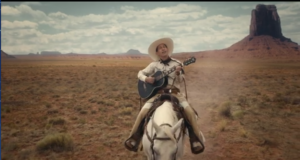 In a pique of bravura sound design, we hear the reverb of Buster’s song as if from within the guitar. 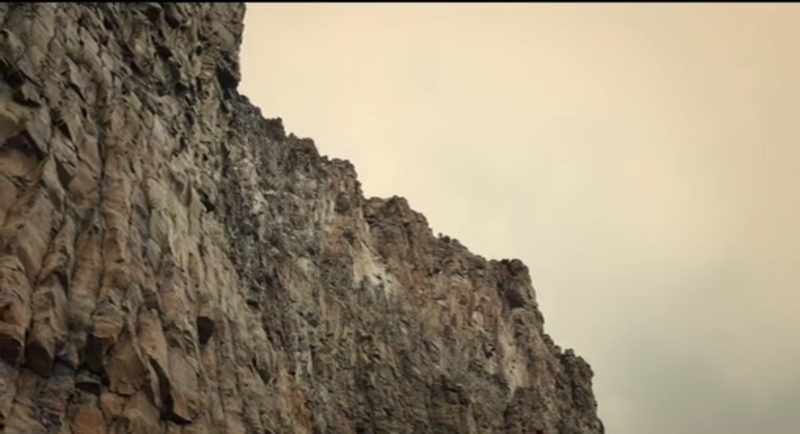 As Buster enters a canyon, the echo of his voice creates a musical refrain, the word, “water” reverberating around the rocks. 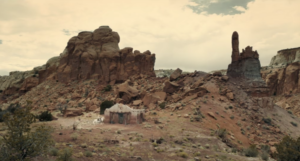 The film cuts rapidly between various shots of the canyon walls, the camera flitting about in vain trying to visually locate the ephemeral sound, as hard to pinpoint as water in the desiccated American Southwest. Buster tells us that he’s arrived at a place of respite. A ridiculously solitary cantina is revealed amidst the barren stones of Monument Valley. Despite no horses or any other signs of life besides Buster outside of the structure, when the singing cowboy enters, he is greeted by a bevy of mean-looking hombres. When the low-lifes in the cantina do not take kindly to Buster, he brutally guns them all down. 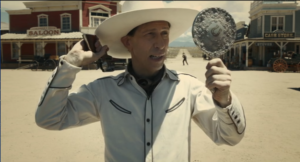 Unlike Gene Autry, Buster’s guns sing just as forcefully as his vocal cords, regardless of the morality of his position. 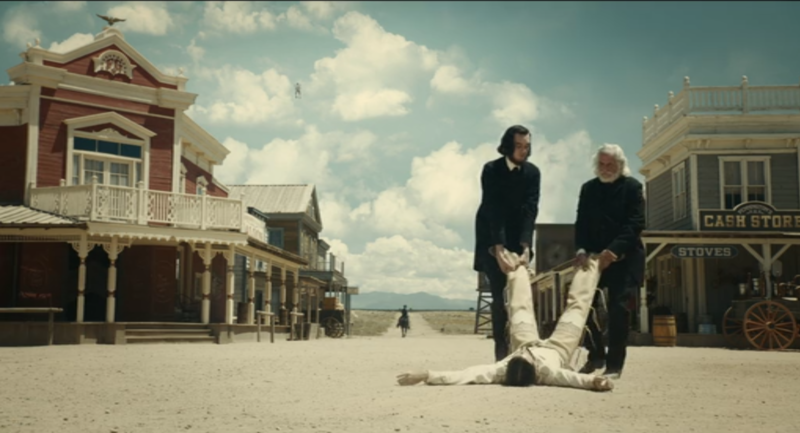 Buster’s reign of violence continues as he enters a Western town and visits its saloon. Joining a poker hand in progress, Buster discovers an excellent set of cards before him. One of the other players demands that Buster play the cards in front of him. We have arrived at the moment predestined by the color plate in the green book. Not wanting to reveal the strength of his hand, Buster refuses to play the cards. 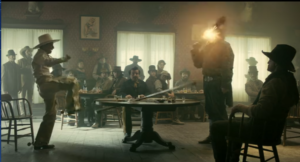 The anger of the poker player across from Buster results in our singing cowboy again triumphing against all odds. Despite the fact that Buster has surrendered his guns at the front door, his nemesis pulls a gun and points it directly at Buster. 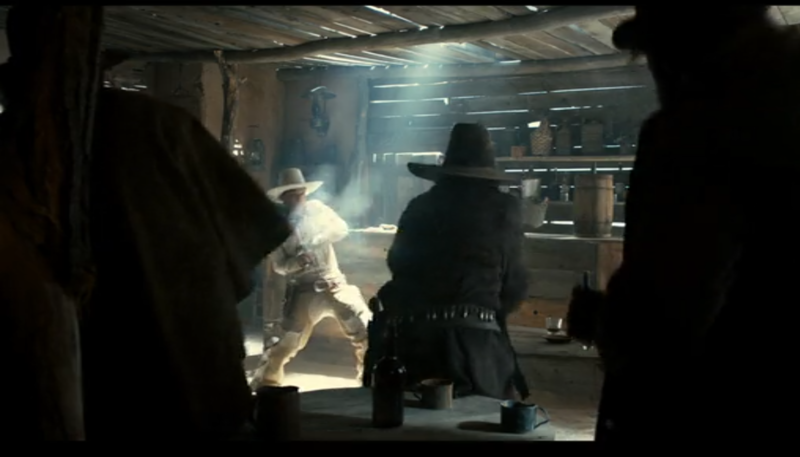 Not deterred, Buster repeatedly kicks a board in front of him, causing the gun to flip and blow the opponent’s head off. 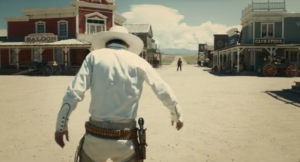 Angry at the death of his kin, Surly Joe’s brother calls Buster out onto the street to exact revenge in a gunfight. Buster asks the brother whether he wants a countdown. When the man agrees, Buster ignominiously shoots off the fingers of his opponent. To add insult to injury, Buster kills Surly Joe’s brother with a trick shot behind his back. 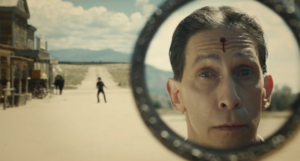 The duplicity of Buster’s arrogance is belied by his image caught in the mirror through which he accomplishes the trick shot. Just as things settle down, another singing cowboy enters the town. 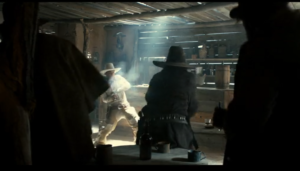 The new musical cowboy, Buster’s doppleganger dressed in black, pulls the same trick on Buster, shooting him before delivering the countdown. 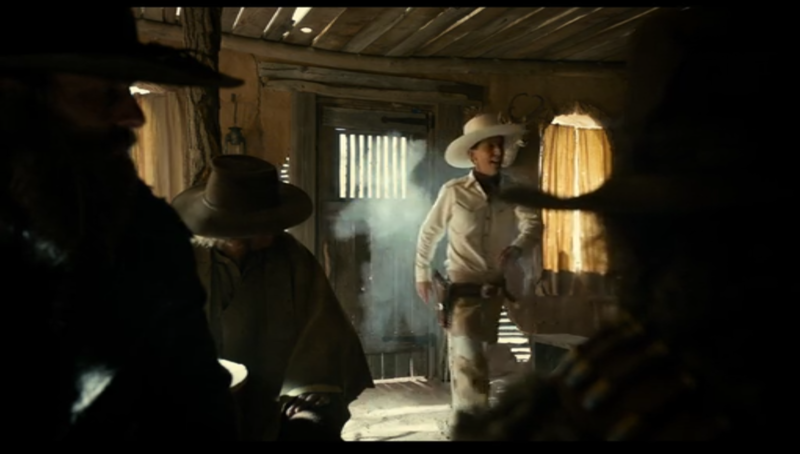 The film thus exposes the fallacy of white and black clothing in Western films tracking directly onto the personae of heroes and villains. 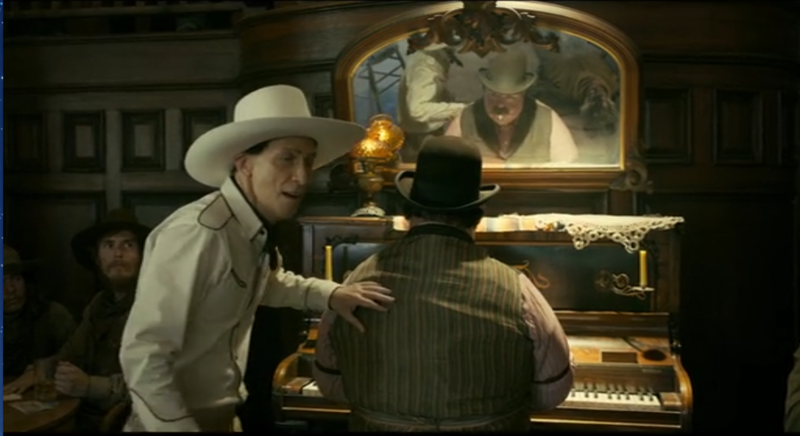 Similarly, just because cowboys sing, they are neither necessarily good nor evil. The behavior of people dressed in white or black clothes can be equally nefarious. The short film, “The Battle of Buster Scruggs” ends with the new cowboy singing his song, replacing Buster. 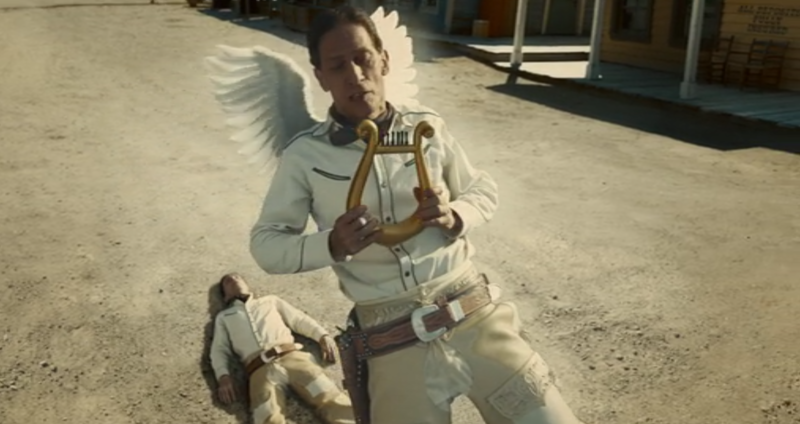 Foreshadowed by a body-shaped cloud of white dust behind Buster in the cantina after he brushes off the dust from Monument Valley, the singing cowboy’s soul rises from his body. 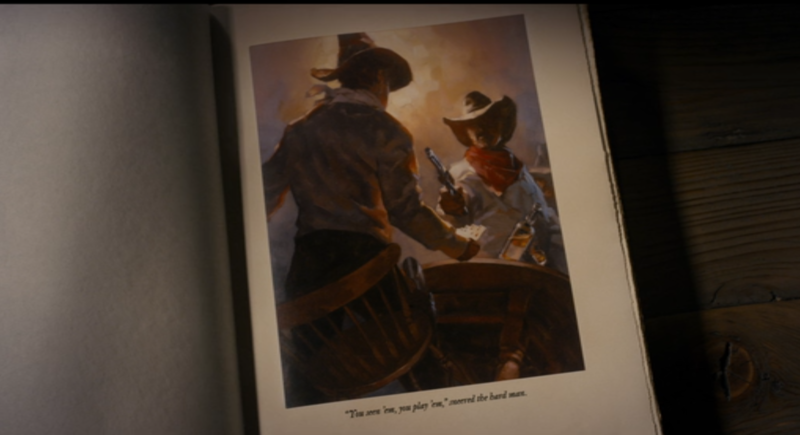 In voice-over narration from beyond the grave, Buster observes, “I shoulda seen this comin.’ You can’t be top dog forever.” The short film ends with this observation, what James Joyce positions as the central effect of a short story, an epiphany, something we in the audience sensed from the ridiculous gunfight in the cantina. 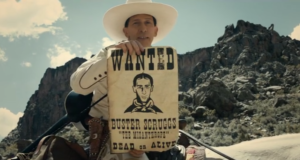 At some point, living his life brazenly engaging in shootouts against a dozen men, Buster must at some point be killed. Buster arrogantly enters every confrontation assuming that because he has a white hat, he will triumph no matter how the odds are stacked against him. 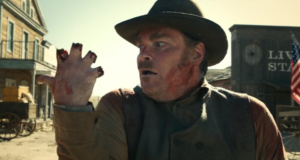 The only thing that allows him to persist are the conventions of the classical Hollywood Western. Earlier in the film, Buster takes offense to the wanter poster which labels him a “mistanthrope,” but this proves to be more accurate than Buster’s self-image as the frolicking singing cowboy from the movies. Ascending to heaven, Buster releases a hint of existential despair: “There’s just got to be a place up ahead where men ain’t lowdown and poker’s played fair. If there weren’t, what are all the songs about?” Of course, we know the songs are mere wish fulfillments, presentations of a West that buries behind mythology the violent foundations of American social life. 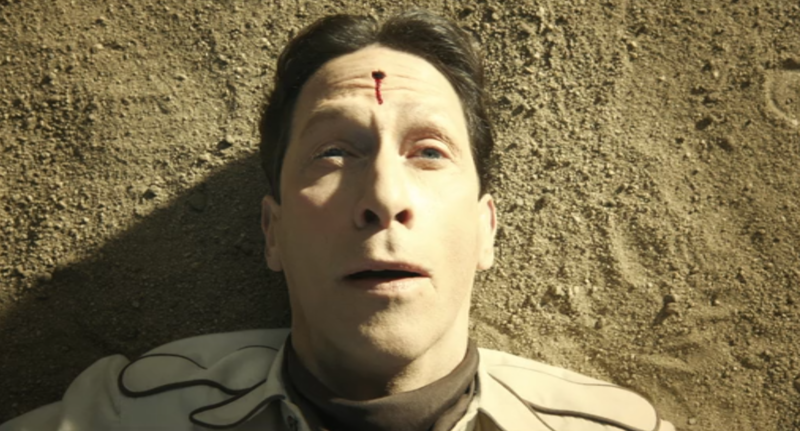 The Coens’ short film thus produces what Edgar Allen Poe calls the single effect, a caustic conclusion to the short story that pierces us like an arrow. 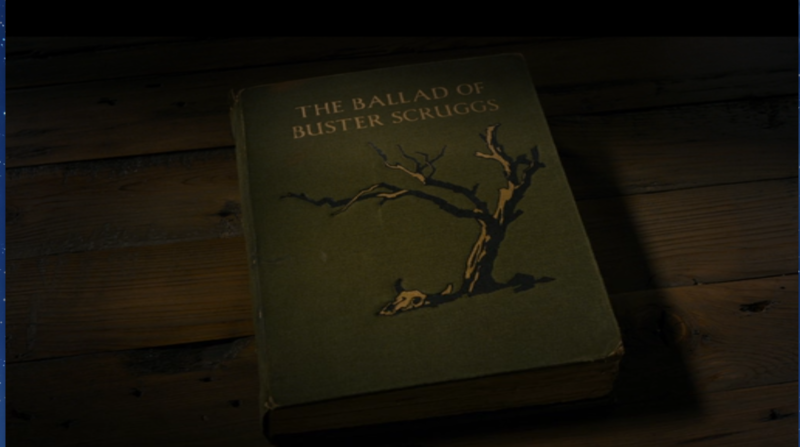 “The Ballad of Buster Scruggs” forces us to reflect upon the building blocks of the mythology of the American Western. 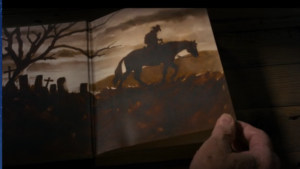 These are stories about heroes who believe themselves somehow different than those around them, yet they turn out all to be doomed to the same fate, caught within the same trap of narrative prevarications that occlude the brutal realities of history.